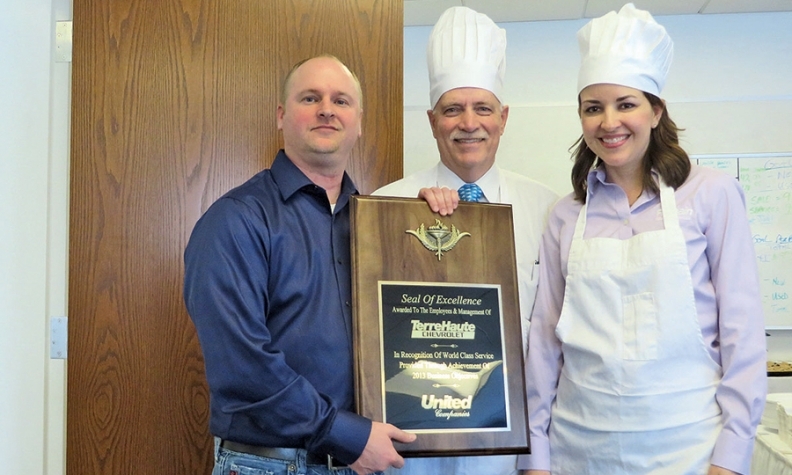 Jay Rogers, left, general sales manager, accepts the Seal of Excellence award on behalf of the entire staff from John Roettger, executive manager, and dealer Amy Romain Barron, who served the employees lunch to celebrate. * Cool perk: An extra day off with pay for achieving Seal of Excellence certification. * General Manager Bill Lutes on recruiting college graduates: "Terre Haute Chevrolet has been recruiting college graduates for several years, working especially with Ivy Tech Community College's automotive department with scholarships and recruiting." * Lutes on showing employees that they are valued: "We offer a 'thank you holiday' to celebrate employee anniversaries. We have pizza or barbecue lunches for achieving monthly/quarterly business unit goals."